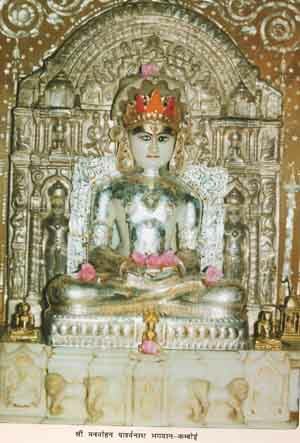 Shri Manmohan Parshvanath Bhagwan in white color, seated in a lotus posture and of height 76 Cms in Kamboi village. (Shve). From one gift document, it becomes evident that Kamboi may have been founded in a period earlier than 11th Vikram century. From the shape and the skill with which the idol is made, the latter is believed to be of King Samprati’s period. On the idols in the temple, there are inscriptions dated 16th Vikram century. 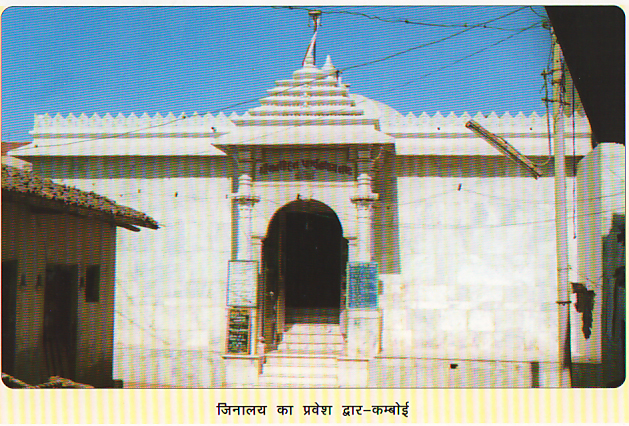 In “Patan Chaitya Paripati” of 17th Vikram century, the shrine of Kamboi is mentioned. The village of Kamboi has been referred to in an inscription on one metal idol dated Vikram year 1638. The last renovations on the temple were carried out in Vikram year 2003. At present there are no other Jain temples nearby. The Lord’s idol looks pretty and serene. The other idol in this temple being of the period of king Samprati look also very artistic. From the village and round about area very often old idols are being discovered which are beautiful. The nearby Railway station as well as bus stand of Kamboi is ½ Km away. From Chanasma, this shrine is 10Kms, Shankeshwar is around 45 Kms, Mehsana is 50 Kms, Patan is 30 Kms, Modhera 30 Kms and Ahemdabad is 200 Kms away from this shrine. Buses and cars can go upto the temple. There is a dharamshala for lodging with all facilities and a bhojanshala. Dry snack is also provided. Dist : Patan , Gujarat.